When you hit those stock-up-and-save sales at the butcher's counter, don't forget to bring home the bacon -- and stash it in the freezer. 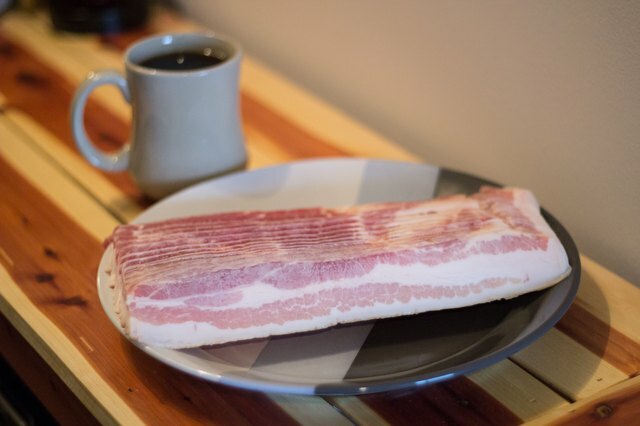 You can thaw the cured pork product quickly in the microwave whenever bacon is a last-minute inspiration. Whether pairing up with eggs in the morning or lending a smokey, crispy component to warm spinach salad, defrosted bacon comes to the rescue as a quick-cooking ingredient. Once you've defrosted bacon in the microwave, you have to cook it immediately for food safety reasons. Unless you've got a big family, you probably don't want to cook an entire pound of bacon at one time. 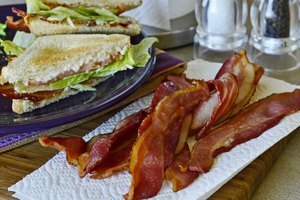 Instead of cooking it all up and then planning to unsafely reheat frozen bacon, package it up into individual portions as soon as you bring it home from the store. 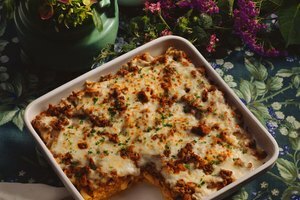 Use foil sheets or individual zip-top bags to hold three or four slices at a time, then pop them all in the freezer for later use. Some freezer-to-microwave brands have instructions that specify that the strips stay in their plastic packaging while you defrost or cook them. It's always best to follow these guidelines when using specialty products. Otherwise, use a microwave-safe plate and paper towels. A double layer of paper towels goes on the plate first. 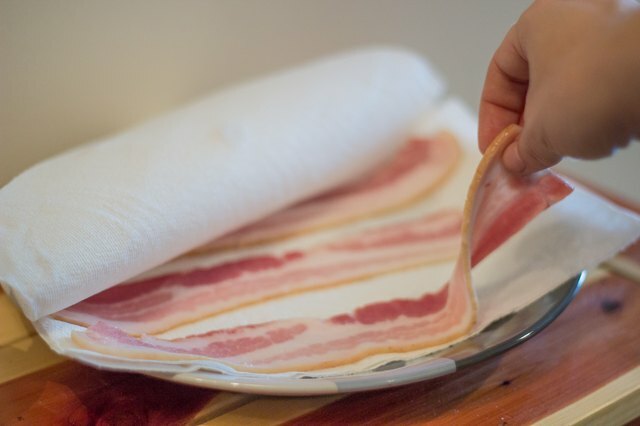 Place the bacon on the layer of paper to soak up any grease that's released. 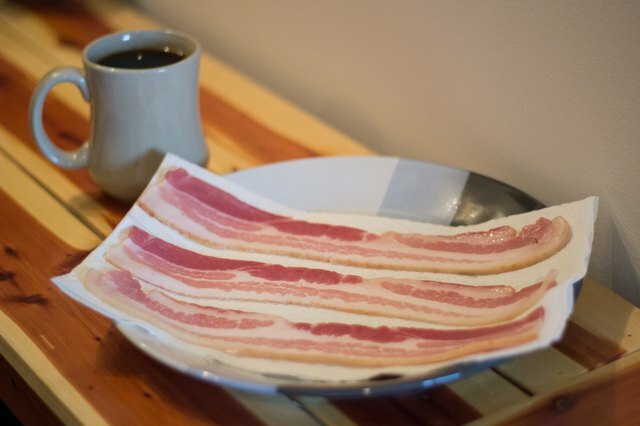 Finally, cover the bacon strips with another paper towel. What's the best way to microwave bacon? How you defrost the bacon depends on your microwave brand. Your model may have a by-weight Defrost setting. You can weigh the strips on a kitchen scale, if you choose, but it's not difficult to estimate weight by how much of the package you're using. For example, one-fourth of a 1-pound package of frozen bacon equals 0.25 pounds. If your microwave doesn't have a Defrost setting, set the power to about 30 percent. A by-weight Defrost setting will set the thawing time automatically. 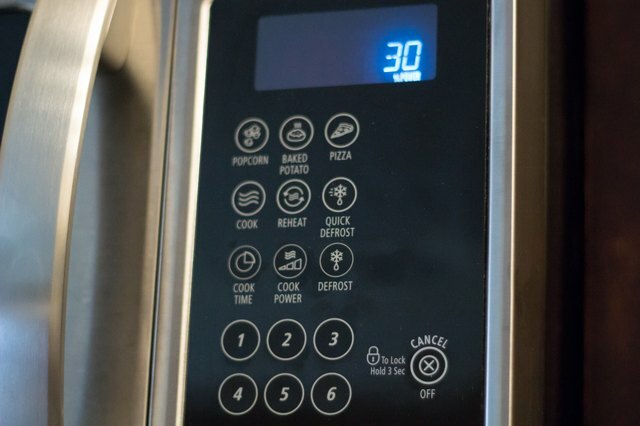 If you've set the microwave to a manual defrost by programming it for 30 percent power, use the standard estimate of about 5 minutes for defrosting 1 pound of frozen food. For a 0.25 pound of bacon, for example, thawing will take about 1.5 minutes. 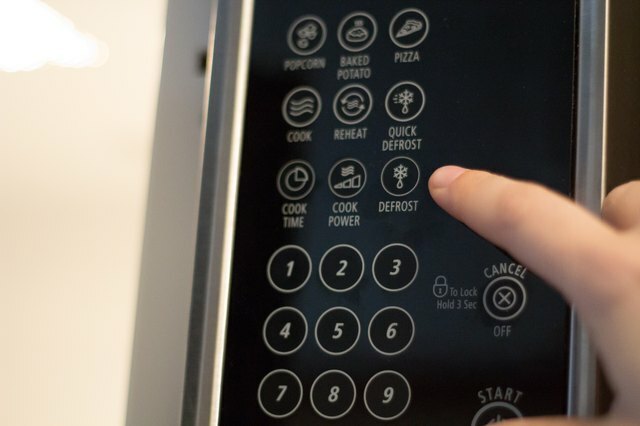 Many microwaves' Defrost settings set the appliance to beep at regular intervals after you press Start. That is the signal for you to move the strips to different sections of the plate, while also turning them over. 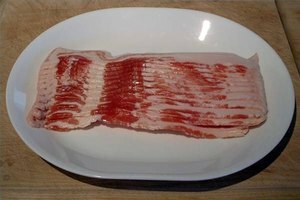 Re-cover the bacon with a paper towel before re-starting the microwave. If your brand does not have a rotating carousel, rotate the plate by about half a turn each time you adjust the bacon strips. If you've set the microwave to a manual defrost, stop it once or twice after hitting the Start button in order to adjust or remove some of the bacon. 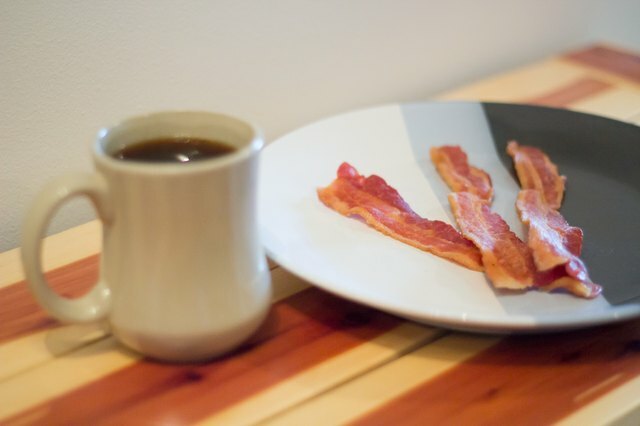 Once you've thawed your bacon in the microwave, you can also cook it in the same appliance. Replace the paper towels with fresh ones, again arranging them on the plate so that the bacon strips are resting on paper towels and are also covered by them. Figure on cooking bacon on High for at least 30 seconds for each strip of bacon. Cook them for a shorter amount of time if the bacon seemed to have slightly cooked during the defrosting stage. Allow microwave-cooked bacon to sit for another 5 minutes, per batch, before uncovering and serving them. Of course, you can opt for cooking defrosted bacon in a skillet or in the oven instead of in the microwave.